We had a wonderful stay at the Big Bear Cabin. It was beautiful and our celebration up there in the mountains of Gatlinburg/ Pigeon Forge was super fantastic. We really didn’t want to leave and we will differently be back, making it a tradition and hopefully staying longer. Thank you Cabins USA!!!!! Overall this was an awesome place to stay with nice views and a very nice setup cabin. A few things to point out for anyone booking in the future. The hot tub was only hot on the first day. The temp dropped down to 86 and after two days only climbed back up to 89 (cover was on), so I suspect a heating problem. If you are going to rent this cabin, you absolutely need a 4x4 or all terrain vehicle. The drive in is pretty serious, I was driving a 4x4 Jeep Grand Cherokee and still slid a few times. The king bed in the master bedroom is very loud, it literally woke my 5 month old up every time we moved. Lastly, there was only one outside trash can for an 8 person cabin and the checkout instructions want you to take all the trash out. We had to shove the trash in and could not get the lid closed (prod not best for bear country). Thoroughly enjoyed our weekend in "Big Bear" cabin! It had everything we needed for a nice weekend away from home. It was very comfortable and I would highly recommend it to anyone. Would love to stay in it again! Cabins USA made check-in easy with Express Check-in, and the staff is extremely friendly. The Big Bear Cabin was a great cabin for our family. Although the driveway is steep it seemed to get easier after a few times. Upon walking into the cabin our family was so excited to see the openness of the cabin. There were plenty of places to sit and enjoy family time. The kitchen was fully stocked with plenty of supplies to cook with. The ice maker was broke, and the ice cube trays that were provided as a replacement were cracked. We ended up just picking up some ice, and didn't bother calling the office as it wasn't a huge issue. The master bedroom/bathroom was nice and spacious. The other two bedrooms were just big enough to fit the beds in them, but weren't bad. The second bathroom was extremely small, and didn't have a full size bathtub/shower. The spiral steps lead up to a small pool table and seating area that the kids enjoyed using. The back porch was amazing and had plenty of seats to relax and enjoy the amazing view! The kids had a great time running around the nice flat backyard. The hot tub is secluded in a screened-in area, and was big enough for the entire family to get in. There is no wi-fi available, but the phone service is pretty good so it wasn't a problem. The drive to Gatlinburg was 15-20 minutes, and Pigeon Forge was about the same. Overall this cabin was great for our family, and we would definitely use Cabins USA when we come to visit again! Need to have the cabin name on a sign and a bigger TV in the living room. The kitchen chairs could stay to be updated but over all a great place to stay. A very nice cabin overall with a nice big hot-tub. My only complaint would be that the pool table was not full size. Lovely cabin. Beautiful views! Gravel road needs grating since there were gullies and washed-out places. Address should be placed where it is visible from the road not up the driveway. Location on the road should be better described, is not the last cabin at the top of the hill. Disappointed that one bathtub did not have a shower although had shower head. All and all a very good vacation. This cabin was amazing! When we arrived on 4/10, but we arrived to a dirty cabin. There was a wad of hair on one of the recliners, a snuff can in the master bedroom, cigarette butts all over the porch, and the hot tub cover smelled like mold. I contacted the office and they sent someone over the next day to take care of the issue. While the cleaning ladies were there, they drained, cleaned, and refilled the hot tub. Then the hot tub wouldn't heat past 66 degrees. So I had to call back and that issue was taken care of. Once all the issues were handled, we loved the cabin. It was beautiful and peaceful. I do suggest however, that the directions to the cabin are changed. It should say the second driveway on the left. Not the first. And the driveway needs to be fixed. Since the road is gravel, the driveway is starting to rut out and we drug our vehicle a couple times. Also, there were bees everywhere. But the beds were amazingly comfortable. The pillows were the best. The cabin all around is absolutely gorgeous. There are other cabins around, but not right beside you. We watched a couple squirrels play one morning for a while. And a house cat came around too. I would stay here again, if all the issues were fixed. We were far enough away from the Parkway, but close enough that we could leave and not have to drive forever to go out and enjoy the day in Pigeon Forge or Gatlinburg. This makes our 3rd time using CabinsUSA and we will be returning! Thank you for such an amazing vacation! Big Bear was nice. Was a little disappointed that the TV was not as pictured. It was much smaller. Also that the DVD player was not Blueray. Other than that it was an enjoyable time & the location was great. Nice & quiet. I would suggest putting a dish drainer in the kitchen for the dishes. Had to use one of the towels to put the washed dishes on to drain. Thank you for taking the time to let us know about your recent stay in Big Bear! We here at Cabins USA work hard to make sure each of our guests have the best stay possible while vacationing in the Smokies. Thank you for your suggestion of a dish drainer. That has been forwarded to our Housekeeping SupervisorWhen you are ready to stay with us again, please mention you are a return guest for an additional discount. Thank you again for your review and thank you for choosing Cabins USA! Directions need changing. It's closer to .4 off Bird's Creek Road than .7. Second road to the right. Watch for Cabin USA sign. Thank you for letting us know about the directions to Big Bear. Management will be making any necessary changes. When you are ready to stay with us again, please mention you are a return guest for an additional discount. Thank you again for your review and thank you for choosing Cabins USA! Cabin was in a good location, close to attractions. We did have a bug problem. There were cockroaches in the kitchen. Otherwise, a nice place to stay. Thank you for all of your kind words! We here at Cabins USA work hard to make sure each of our guests have the same great stay you enjoyed while vacationing in the Smokies. I apologize for the insect issue you experienced during your stay. Maintenance has beeen notified and will be addressing that issue. When you are ready to stay with us again, please mention you are a return guest for an additional discount. Thank you for choosing Cabins USA and we look forward to having you as our guest again! Big Bear is a beautiful cabin it is just a long curvy drive !! It was very spacious and clean had everything we needed!! The hot tub never warmed up stayed 66 degrees! We would go there again !! Thank you for taking the time to let us know about your recent stay in Big Bear! We here at Cabins USA work hard to make sure our guests have the best stay possible while vacationing in the Smokies. I apologize for the issues you experienced with the hot tub. Maintenance has been notified and will be working to correct the issue. When you are ready to stay with us again, please mention you are a return guest for an additional discount. Thank you again for your review and we look forward to having you as our guest again! Thank you for taking the time to let us know about your recent stay in Big Bear. We here at Cabins USA work hard to make sure each of our guests have the best stay possible while vacationing in the Smokies. Thank you for all of your suggestions. Those have been forwarded to our Owner Liaisons and they will be bringing those to the owner's attention. When you are ready to stay with us again, please mention you are a return guest for an additional discount. Thank you for choosing Cabins USA and we look forward to having you as our guest again! We were upgraded to a better cabin because the AC unit in our cabin broke. It would've been nice to have a cabin That had all of the same amenities such as the Wi-Fi. The unit was really clean except I think whoever clean the kitchen did not do a very good job of using a clean rag. All in all, our family had a very good time and it was peaceful. I am happy to hear that we were able to accomodate you when the air conditioning in the original cabin you reserved quit working. We here at Cabins USA work hard to make sure each of our guests have the best stay possible while vacationing in the Smokies. I apologize this cabin did not have WiFi. Each of our cabins are privately owned and so it is up to the owner if it offers that amenity. When you are ready to stay with us again, please mention you are a return guest for an additional discount. Our reservationists will also be more than happy to help you find another cabin with WiFi. Thank you for choosing Cabins USA and we look forward to having you as our guest again! Thank you for your suggestions. Those have been passed on to our Owner Liaisons who will be bringing this to the owner's attention. When you are ready to stay with us again, please mention you are a return guest for an additional discount. Thank you for choosing Cabins USA and we look forward to having you as our guest again! Thank you for taking the time to let us know about your recent stay in Big Bear. We here at Cabins USA work hard to make sure that each of our guests have the same great stay you experienced while vacationing in the Smokies. Thank you for letting us know about the drive to the cabin. This will be shared with our reservationists so they can make future guests aware. Thank you again for your review and thank you for choosing Cabins USA! The king bed was horrible. The owners need to put in a new bed. The staff tried to help with a mattress topper but it still wasn't the best. This was a great experience for my family! Loved the cabin. Didn't need anything. All was there. Had a bad smell in one bathroom (not sure why). And the ice maker didn't work in the fridge. But overall was a great vacation for us. I loved how it was by itself. Will definently be renting through cabin USA again!! I am so happy to hear that you enjoyed your stay in Big Bear! We here at Cabins USA work hard to make sure that each of our guests have the same great stay you enjoyed while vacationing in the Smokies. Thank you for letting us know about the ice maker and the smell in the bathroom. We will have maintenance go out to the cabin and correct those issues. Thank you again for your review and we look forward to having you as our guest again! If you are looking for seclusion, Big Bear is the place for you! Not far from area attractions but when you get to the cabin, there is nothing in sight. No people close around…that's for sure! Nice place once you get accustomed to the isolation. Thank you for letting us know about your recent stay in Big Bear! 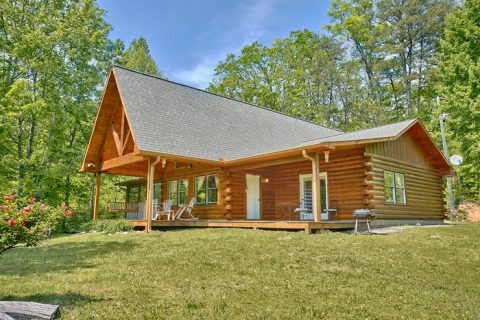 Whether you're looking for a cabin with great views or a little more privacy, Cabins USA is sure to have the perfect cabin for your next trip to the Smokies. When you are ready to stay with us again, please let our reservationists know you are a return guest for an additional discount. Thank you again for your review and we look forward to having you as our guest again! I love the cabin Big Bear, it's a beautiful cabin and has a beautiful view. Me and my Husband had our wedding at this cabin so it is extra special to me. Thank you for choosing Cabins USA for your special day! We work hard to make sure that each of our guests have the same wonderful experience you did while vacationing in the Smokies. When you are ready to stay with us again, please let our reservationists know you are a return guest for an additional discount. Thank you again for choosing Cabins USA and we look forward to having you as our guest again! The big tv didn't work in living room, was a bummer to my youngest who wanted to watch tv in 'his' room. Thank you for talking the time to let us know about your stay in Big Bear! I apologize for the issues with the living room television. Those have been forwarded on to our maintenance department and will be corrected. When you are ready to make your next reservations, please let our reservationists know that you are a return guest for an additional discount. Thank you again for your review and we look forward to having you as our guest again! Thank you for such a positive review! We look forward to you staying again. We were upgraded due to a plumbing problem. I was satisfied with the overall service, the cabin, pretty much everything. We have used Kimble Rentals several times in the past and have been very pleased with our stay. This cabin was a little tricky to find and the bath faucets needed some repair. But it did not detract from our stay. We enjoyed it very much. I have recommended Kimble to my friends and will continue to use Kimble in the future. We had a wonderful time at Big Bear cabin. Everybody in the group enjoyed the place, especially the kids.